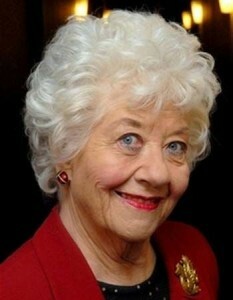 #47 - Actress Charlotte Rae • Where Hollywood Hides... the home of classic TV, movies, music, & celebrities! Actress Charlotte Rae joins Bob & Suzanne for an intimate conversation about her long career on stage, screen, and television, during which she gives some very sage advice for any actor dreaming of show business success. 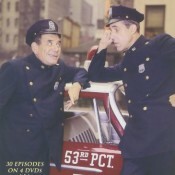 “Car 54, Where Are You?”, Charlotte’s early TV appearance. In this interview, you’ll hear Charlotte talk about studying acting at Northwestern University alongside future stars like Cloris Leachman, Patricia Neal, and Paul Lynde, and how she broke into the “golden age” of early television on shows like Armstrong Circle Theatre and The Phil Silvers Show. She shares her delight at becoming a series regular on the classic comedy Car 54, Where Are Car 54, Where Are You? which led to a long and impressive career in which she appeared on practically every major TV series over the next fifty years. 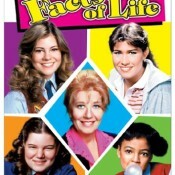 Of course, Charlotte Rae is best known for playing “Edna Garrett” in nearly 200 episodes of Diff’rent Strokes and its spinoff series The Facts of Life, for which she earned an Emmy nomination. Twice nominated for Broadway’s Tony Award as Best Actress in Pickwick and in Morning, Noon and Night, this is a multi-faceted star of historic renown. 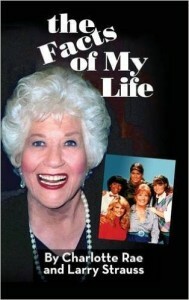 “The Facts of My Life” by Charlotte Rae…the real story behind an incredible acting career! During the interview, Charlotte generously gives some excellent advice for anyone hoping to follow in her footsteps and proudly describes writing her new very revealing autobiography The Facts of My Life, now available on Amazon.com and in bookstores everywhere. If you want to know the truth about how a lasting show business career is built, this is a conversation you’ll want to hear…and The Facts of My Life is required reading. Come meet Charlotte and hear her tell it all in her own words on this free iTunes podcast.